My earliest memory of cookies are not fond ones. I blame it all on my kindergarten "Sports Day" (aka worst time of the school year) where we'd have to run across the field and pick up a cookie off a bench, eat it and then run back to the other bench and eat another one, the vicious cycle would continue a couple of times, I can't remember for how long but I think it was long enough! It was something I dreaded (I was a very lazy kid) and worst of all the cookies were not at all tasty. Now, come to think about it, I don't think it made that much sense, run and eat a cookie, No, No, No! Thankfully, I don't run across any fields for cookies but I will definitely run to the kitchen to whip some up. My grandmother would get a dozen or more cookies that were lightly spiced and flavored with fennel and cardamom. They were fat, round and fragrant with the aromatic spices that were blended into the dough. This is my take on those cookies she had happily pick up from her baker. 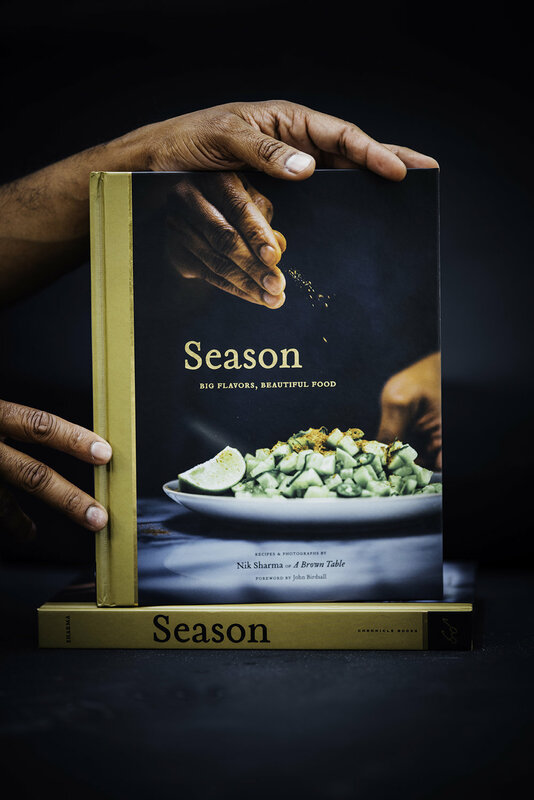 I take great pride in my heritage and love infusing the flavors of Indian cuisine in everyday cooking. 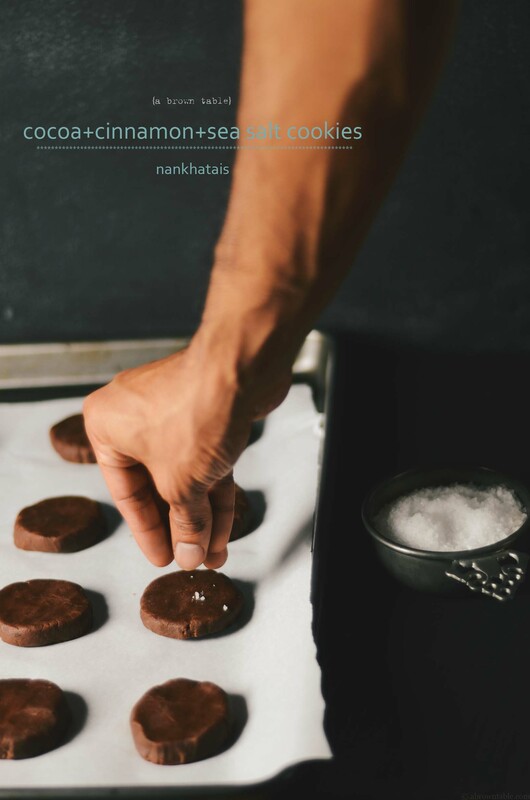 These cookies are extra special because they also bring back wonderful memories with my late grandmother from whom I have watched and learned to cook from. I made these cookies with Bob's Red Mill almond meal/flour and then added some turmeric for color and a whole buncha seeds for flavor and spice. 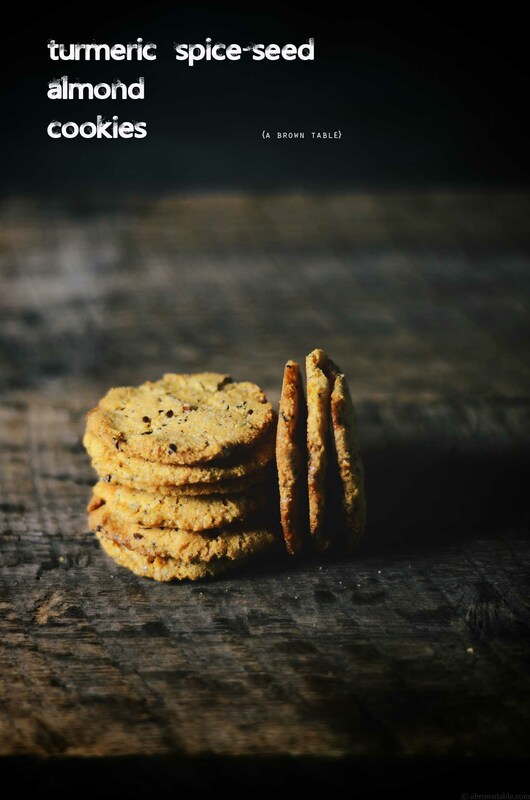 These cookies are deliciously crisp and thin, flavored with fennel, flax and poppy seeds and colored with turmeric. But there's also a delicate hint of black pepper for that extra amazing little kick. 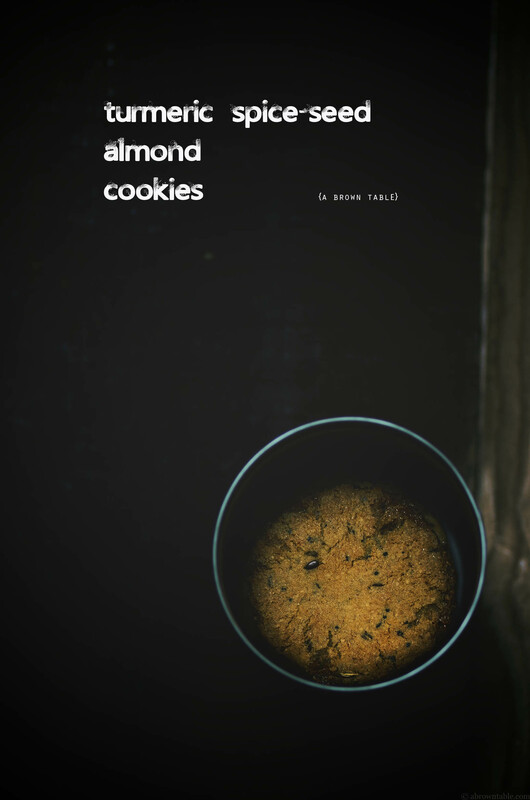 I had a really hard time trying to come up with a name for these almond cookies. The turmeric kept hinting at "Golden cookies" but I kept debating with myself, I finally settled for something a little less glamorous but hopefully does it justice. Either way, I hope you love the cookies as much as I do! 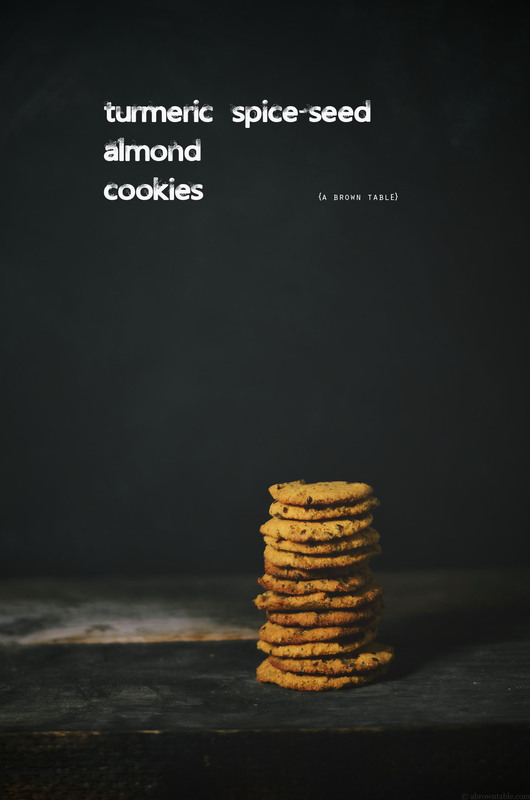 I used Bob's Red Mill Almond flour in these cookies and the cookies turned out perfect. The flour has fine grains making it easy to work with. The folks at Bob's Red Mill are sponsoring a giveaway for one lucky winner, all you need to do is go to the Rafflecopter widget and follow the instructions. You can win a bag of their delicious Almond meal flour and a $20 gift card to their store. So go ahead enter and best of luck!!! This contest will run from April 4th through April 12, 2014. I did not receive any financial compensation from Bob's Red Mill for this post and all opinions are my own unless stated otherwise. 1. 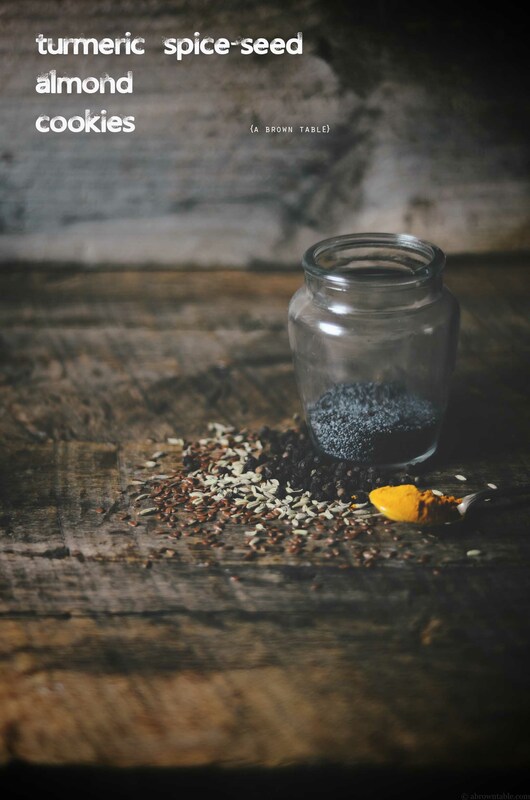 In a large mixing bowl, mix all the ingredients from the almond flour to the black pepper with a whisk until all the ingredients are evenly mixed. 2. Whisk the egg lightly in a small bowl. Fold the egg into the dry ingredients and stir with a wooden spoon or spatula until completely combined. Bring the dough together into a ball, cover with cling film and refrigerate for at least 30 minutes before baking. 3. Place a wire rack in the middle of the oven and preheat to 350F. 4. Line a baking sheet with parchment paper and take a generous teaspoon of the dough, mould it into a small ball with the palms of your hand and place it on the baking sheet. Bake 9 cookie dough balls at a time and space them around 2 inches apart from each other, for approximately 10 minutes or until the edges begin to brown. The cookies will rise during baking and eventually flatten. Once baked, allow the cookies to rest for 5 minutes on the baking sheet and then transfer to a wire rack to cool completely. Store in an airtight container. 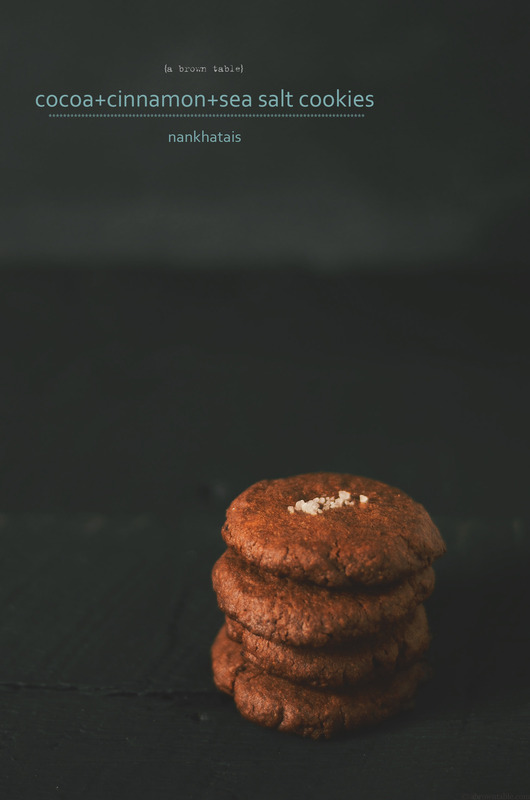 In "Cardamom", "Cookies", "Dessert", "Fennel", "Indian", "Spices", "black pepper", "cookie", "flax", "gluten free", "turmeric"
cocoa cinnamon sea salt cookies "nankhatais"
I'm placing the pies on the side right now because it's really time to focus on baking cookies and cakes. I love Christmas for the food and desserts but also because it has always been one of my favorite holidays of the year. Every year around this time, my mom would get together with her mother and sisters to prepare loads of holiday sweets. This is something they took very seriously and still do so much so that I know my mother would take time off from her job to bake and prepare tons of holiday desserts. We also had another tradition, where we'd take sweets to our neighbors and friends. This is something, I was never a big fan of and I always preferred sharing the sweets that were at the lower end of my "dessert-love scale". My mom on the other hand would reevalute the contents of the gift basket and undo all my hardwork, so the good stuff went back in. I am really not sure who benefited from this exercise but it clearly wasn't me! These days, I make holiday desserts that I really, really love and make enough to gift to friends and family while keep enough to last us for a few weeks. These cookies are fall into this special category of holiday desserts that I must make every year. They bring back nostalgic childhood memories of baking with my mother and her family, memories laced with sugar, flour and above all things, love. Indian "
as these cookies are commonly known, are crispy and eggless. 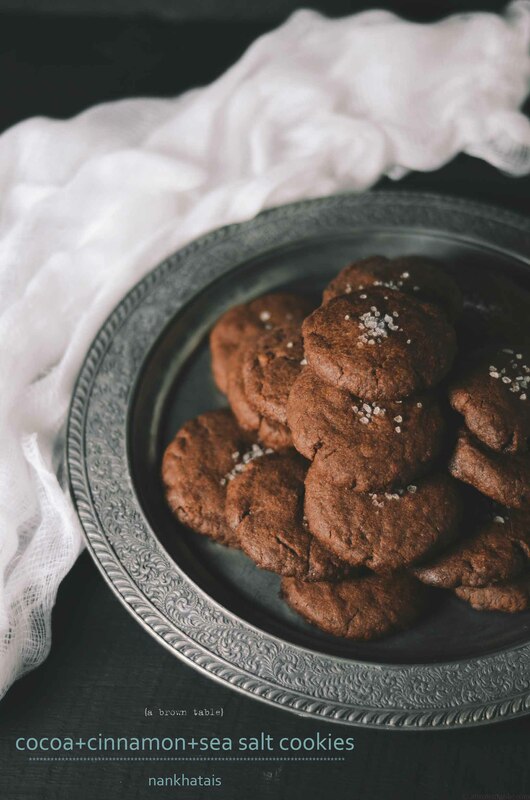 You will love them, the cookies are crisp all-throughout with a deep dark cocoa flavor with a hint of black pepper and cinnamon that will warm you up. 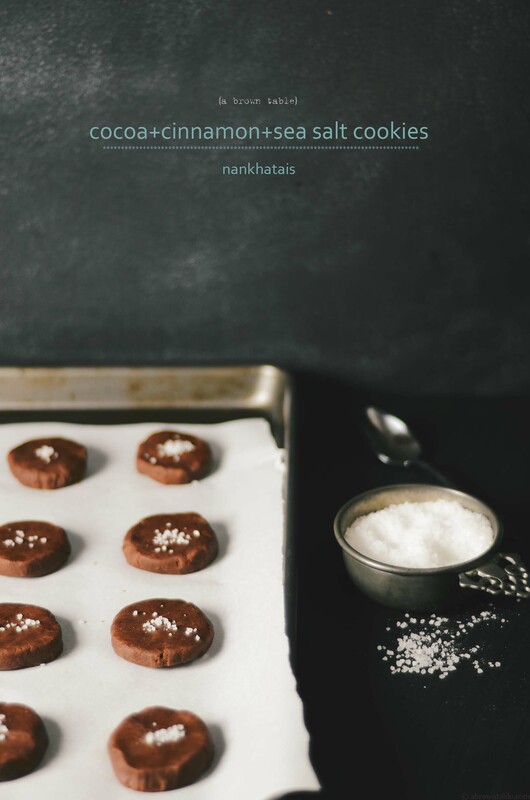 The center of each cookie is topped with a generous sprinkling of sea salt crystals that will shock your tastebuds with a delicious amalgam of sensory wonder.
. They are a great addition to your breakfast table at Christmas. This recipe calls for the use of Indian ghee or clarified butter. Ghee is super easy to make and has a wonderful fragrance and taste. You simply melt unsalted butter in a thick bottomed stock pot until all the fat has melted and the milk solids have separated. The butter is melted and cooked on a low flame to prevent burning of the solids (this is different from browned butter where you want to use the browned milk solids for flavor) but not boiled. The melted fat is then passed through a sieve lined with several layers of muslin/cheese cloth to filter out the separated solids. The resultant fat that is collected is ghee and stored in the refrigerator. It solidifies as it cools. I've been finding ghee in most grocery stores these days but if you need to prepare it at home, start with 3-31/2 sticks of butter to get around 2 cups of ghee using the instructions I just described. 1. Whisk all the dry ingredients from the flour to the sugar in the mixing bowl of a stand mixer. 2. Add the ghee to the dry ingredients and mix on medium-high speed until combined. The mixture should acquire a fine crumb-like texture. Cover the bowl with cling film and refrigerate for at least two hours. There is no need to bring the dough together to form one large ball, just store the dough in the crumb-like phase. 3. Before baking the cookies, remove the bowl from the refrigerator and let it sit at room temperature for 30 minutes. 4. Preheat the oven to 350F and place the baking rack in the middle section of the oven. Take some of the mix in your hands and press and mold together to form small one inch balls. The warmth from your hands will soften the ghee and help to bring the cookies together. Flatten the ball into discs that are about 2 inches in diameter. The cookie discs might crack a little on the edges so press and mold them gently. If they do crack a little, just push the cracked ends closer to seal the gap. (Personally, I don't mind a few minor cracked edges). 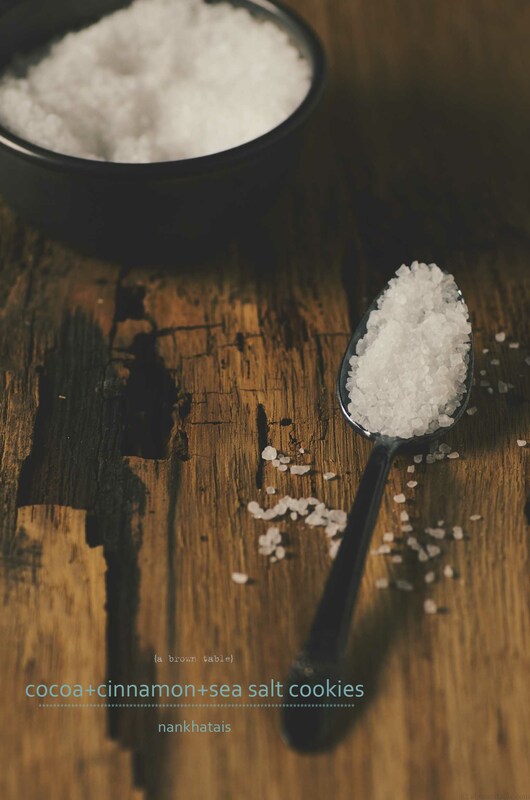 Sprinkle a pinch of the sea-salt crystals over each cookie. 5. Place the cookie balls on cookie/baking sheet pre lined with parchment paper and bake for 15-20 minutes until the edges start to get crisp and appear a little darker than the color of the cocoa. Transfer the cookies to a wire rack to cool completely and store in air-tight container for up to two weeks. 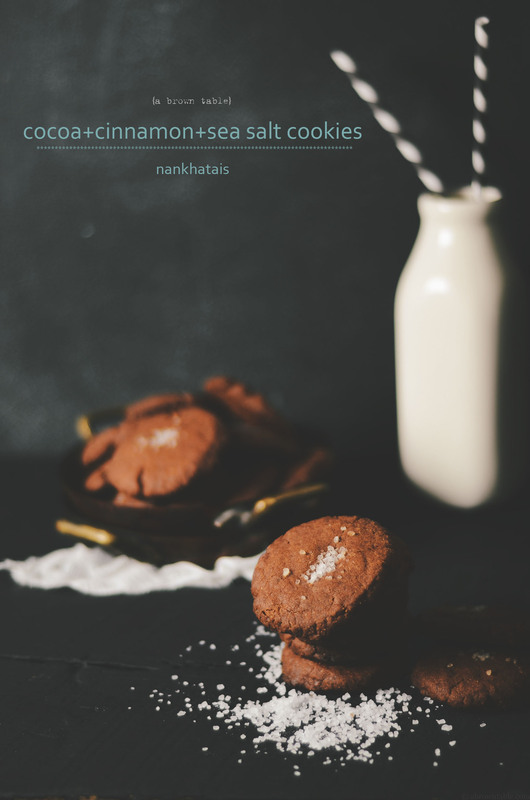 In "Christmas", "Cinnamon", "Cocoa", "Cookies", "black pepper", "nankhatais", "sea salt"